1. What age groups is your new CD program for? We designed the program for any club, academy, college, or professional soccer players. Soccer players 12 years of age and up can complete the program on their own. We suggest that a coach or parents helps kids 11 and younger complete the program. 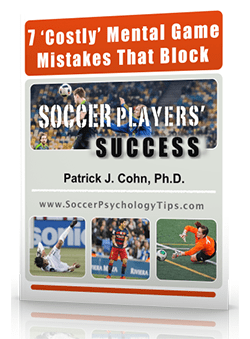 High level and professional soccer players will also benefit from our mental strategies. 2. Is your new CD program sent via mail or downloaded on the website? 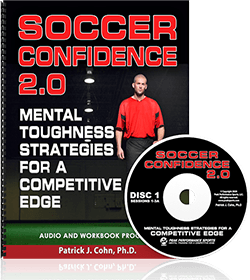 Right now, Soccer Confidence CD and Workbook program is only available by postal mail. Your order will only take 2-3 days to ship (in US). In the future, we may offer this as a digital download. The program does come with five free bonuses that are available to download, immediately after purchase. 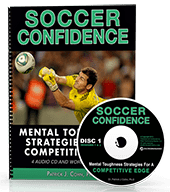 3. Who can benefit from Soccer Confidence CD program? Soccer players can benefit from the CD program. However, we believe that soccer coaches and parents can use the program to help their athletes as well. 4. How much time is required to complete each of the 8 sessions in the workbook? Each of the 8 CD lessons takes about 30 minutes to complete. You’ll also want to complete the workbook exercises too, which will take about 20 minutes to complete each session. 5. Can I buy the Workbook and CD program for my whole team or club? Yes, we do offer team and club pricing. Please call us at 888-742-7225. 6. How long does your introductory offer last for? The introductory price of the program lasts about one week. We often provide discounts on new products to reward people who take fast action. We’ll sell the program to the public at full price starting June 26, 2013. 7. What if my athletes don’t want to complete the program after we purchase it? We offer a full money-back guarantee when you ship the workbook and program back to us within 30 days after the date of purchase.